Welcome to the first in a new series of posts where I'll be taking a look at some of the UK's most stunning boutique hotels, B&B's and self catering accommodation. They're all places in which I have either stayed in the past or would love to check in to in the future. Of course, I'm focussing mostly on the interior design and architecture rather than the location. Some are are classic, some are quirky and some just down right extravagant - I'm not much of a sightseer anyway. I have been itching to stay at a Crazy Bear hotel for years, ever since I came across the image above. I mean, just look at those chairs! And the leopard print carpet! Sadly, I have yet to meet anyone wealthy enough to whisk me away for a Crazy weekend, so it remains a pipe dream. The original Crazy Bear, it first opened its doors to guests 25 years ago and since then the group have gone on to add two more hotels to their portfolio - first in Fitzrovia, London in 2004 followed by Beaconsfield in 2008, the latter of which occupies a fifteenth century coaching inn, the oldest building in the town. Each one has been meticulously designed with such lavish detail that even an anti-maximalist like me can't help but like it. Who wouldn't want to stay in a room with crushed velvet walls?! 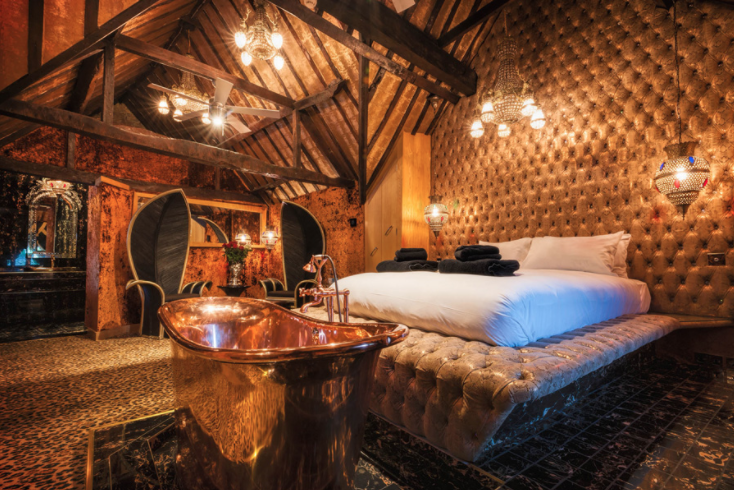 The mix of old architecture and uber extravagant interiors in both Stadhampton and Beaconsfield is unconventional and surprising but it's what makes a Crazy Bear hotel, well, crazy! It's hard to know where to begin to describe the décor but I'm thinking if King George III was alive today this is what Buckingham Palace would look like! It's totally OTT and there's just about every genre thrown in, from animal prints to Moroccan style fretwork. It's certainly not for the faint-hearted and I certainly couldn't live with it but I'd give it a go for a couple of nights!